Is there any empirical evidence to support this claim? There are different potential interpretations of what "the morning after" is (for example, the period between midnight and noon), but the intended interpretation is probably, as you said, "people who have slept and then chose to drive the morning after". 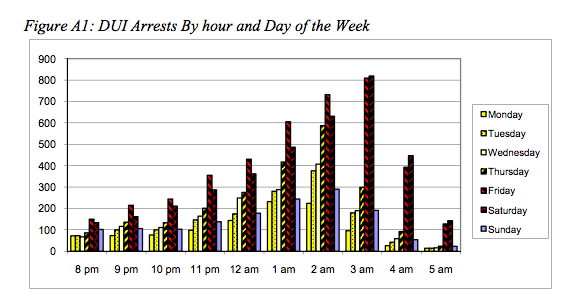 While there's no way to tell who went to sleep (and who didn't) before their DUI arrest, a reasonable guess can be made. 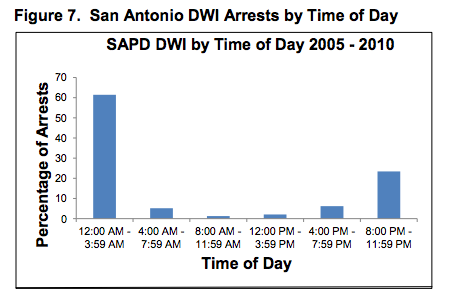 Although alcohol affects sleep, I would expect most people, after a night of partying, to not be awake and out driving until 5am or (much) later. (Reasoning: Most Americans leave for work between 7 and 8am. Plus, 5am is always before dawn at my latitude, with sunrise today, New Year's Day, being ~7:30am. 5am is probably overly early, but the same conclusions apply if you pick a later time.) 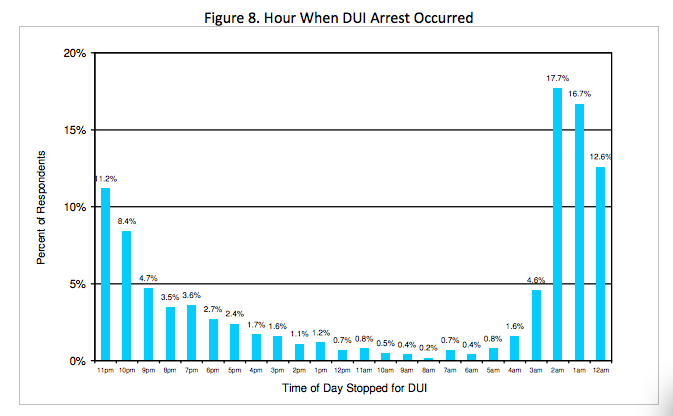 There are very, very few DUI arrests that happen between 5am and noon, much fewer than 8pm to midnight or midnight to 3am/4am (and that also includes anyone who woke up sober, got drunk, and then drove their way to a DUI arrest sometime between 5am and noon). 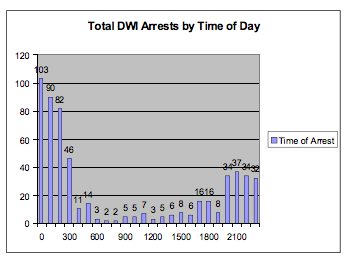 Nearly 3,400 persons completed the DUI Offender Survey across classes for persons with a DUI across the state of Montana. 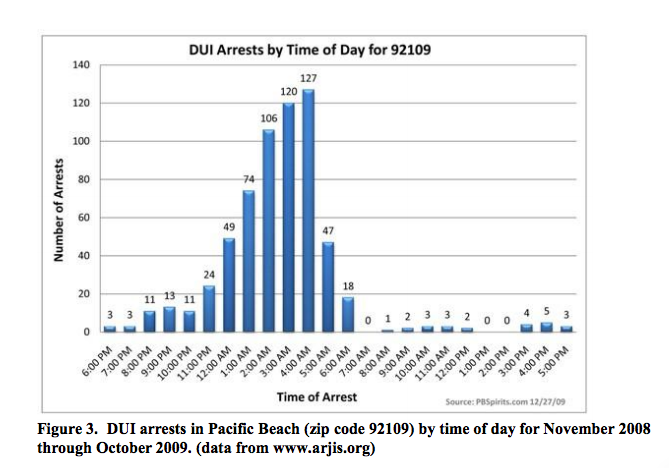 A few key patterns are apparent; (1) most DUI arrests take place between 10 pm and 3 am on Thursday through Saturday evenings, (2) alcohol related arrests peek at 8 pm and again around 2am, and (3) the time profile of DUI and alcohol related arrests on Friday and Saturdays are much better tracked by movements on Thursdays that any other day of the week. Not the answer you're looking for? Browse other questions tagged criminology alcohol .